We live in a fast-paced world. With the use of smartphone technology, people can multi-task like never-before. Mobile communication is getting faster, smarter and more efficient. Live phone calls are becoming a thing of the past with nearly two thirds of smartphone users using messaging more than five times a day. People know what they want and expect immediate action, but also like to respond to messages in their own time, when it is most convenient to them. Google AdWords has been offering users unique ways to connect with products & services for 16 years, and is staying on beat to the ever-changing needs of the consumer. Therefore, they have created Message Extensions. These extensions are click-to-message ads that give users the ability to start a conversation and communicate in the time they see fit. Want to book a reservation at a local 5-star restaurant? Search the restaurant, click the text message bubble within the ad, and send a text asking about table availability. Because that restaurant is equipped with a phone number that can send and receive text messages, they can easily and quickly reply. Does this sound like a feature you’d like to try in your AdWords account? It’s a free extension, and it is here (if you don’t see it in your account yet, keep checking as it’s a rolling change from Google)! 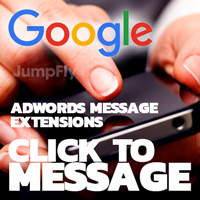 Contact JumpFly today to discuss this and the many other useful tools that Google AdWords can offer your business. 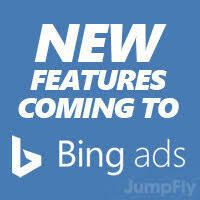 Bing Ads will soon support the Expanded Text Ads as now available in Google AdWords accounts. This new ad format allows PPC advertising customers to provide more detailed information to prospective customers, translating into more clicks, higher click-through rates and more traffic to your website. Expanded text ads allow for better visibility on the search result pages and give you more control over your ads and allow you to create more compelling calls to action. This new ad format is always mobile optimized, and works seamlessly on mobile, desktop and tablet. Expanded Text Ads will allow for a 60 character headline (two 30-character ad titles separated by a hyphen), 80 characters of ad text, and a Display URL that is automatically-generated from the Final URL and customizable URL path. Bing Ads will soon introduce Shared Budgets as a way to more effectively manage your overall daily budget across campaigns. A Shared Budget will automatically distribute a single daily budget across all campaigns or selected campaigns within your account. Shared Budgets will be available for all Bing Ads applications, including the Web User Interface (in the Shared Library), API, Editor, and mobile apps. Using a single Shared Budget will help you optimize under-utilized spend from one or more campaigns by automatically redistributing it across other campaigns that are performing well. Additionally, it will help minimize the amount of time you’ll need to spend calculating how to allocate a set budget among a large number of campaigns. The ability to segment your performance data is now available in Bing Ads. Now you no longer need to run a report to see how your campaign is performing in various venues. You can now segment campaigns, ad groups, ads, keywords, and even ad extensions into rows based on Time (Day, Month, Quarter, Year or Day of the Week), Network, Device, or Top vs. Other. You can download the data directly from the table into a .csv or Excel report to share with clients or colleagues. Segmenting your data can give you valuable information regarding how your campaigns perform at certain times, on particular devices, or on particular networks, helping you make well informed adjustments to ad schedules, device targeting, and keyword bids. Last Click Attribution (the current default) – Gives all credit for the conversion to the last-clicked keyword. This is most effective for those with the most conservative growth strategies. First Click Attribution – Gives all the credit for the conversion to the first-clicked keyword. This is the most growth-oriented strategy. Linear Attribution – Distributes the credit for the conversion equally across all clicks on the path. For a moderate growth strategy. Time Decay Attribution – Gives more credit to clicks that happened closer in time to the conversion. For a conservative growth strategy. 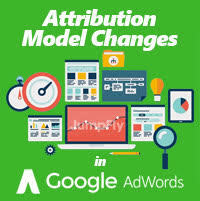 Position-Based Attribution – Gives 40% of the credit to both the first- and last-clicked keyword, with the remaining 20% spread out across the other clicks on the path. For a growth-oriented strategy. Data-Driven Attribution* – Gives credit to the clicked keywords based on how imperative they were in the conversion process. This is based on the account’s performance. *Note: only accounts with 800+ conversions and 20,000 clicks in a 30-day span to qualify to use this type of attribution. Choosing the right attribution model will help you put the performance of different keywords into the proper perspective. This will give you a truer sense of the value of a keyword and allow you to have more insight when setting bids on that keyword. You may also discover that keywords used earlier in the conversion process have more influence than you realized, which can help you avoid pausing or underbidding on these keywords.